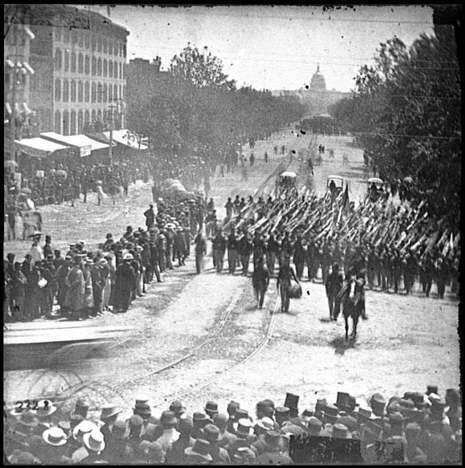 On May 23, 1865, the Army of the Potomac celebrated the end of the Civil War by parading down Pennsylvania Avenue in Washington, D.C. Only weeks before, mourners watched Abraham Lincoln's funeral cortege travel the same thoroughfare. With many buildings still dressed in black crepe, this joyous procession could not help but remind spectators of that unhappy occasion. If the streets in your town could talk, would they have any interesting stories to tell? You can imagine that stories of Pennsylvania Avenue, the street that connects the White House to the Capitol in Washington, D.C., would be fascinating--so much has happened there! 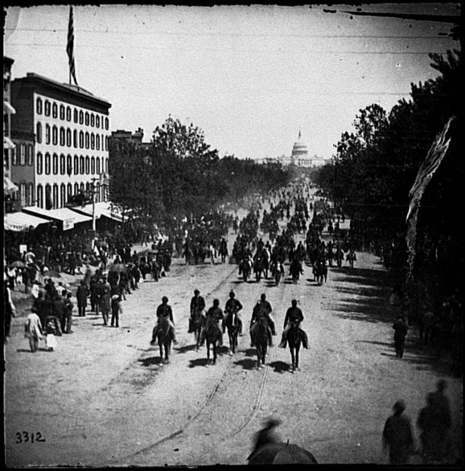 On May 23, 1865, the Army of the Potomac celebrated the end of the Civil War by parading down Pennsylvania Avenue. Only weeks before, mourners watched Abraham Lincoln's funeral procession pass by along the same thoroughfare. Many of the buildings were still dressed in black crepe as the Infantry Unit came marching up the avenue. Pennsylvania Avenue, America's "Main Street," was one of the earliest streets constructed in the federal city. Both George Washington and Thomas Jefferson considered the avenue an important feature of the new capital city. At first, this "Grand Avenue" was just a dirt road that Jefferson had planted with rows of fast-growing poplar trees. That stretch of the avenue between the White House and the Capitol has served the country well as a ceremonial heart of the nation. What other things have happened on Pennsylvania Avenue? Each U.S. president since Jefferson has paraded up Pennsylvania Avenue after taking the oath of office. The funeral processions of the seven presidents that died in office followed this historic route. But the avenue is not just the setting for official events. People who are not famous have paraded and protested down that road. Jacob Coxey led 500 supporters down Pennsylvania Avenue to demand federal aid for the unemployed in the 1890s. Alice Paul marched with the suffragists in 1913. And there was much more. Ask your family what parades, protests, and events they know of that were held on Pennsylvania Avenue. When Johnny comes Marching Home Again, Hurrah, hurrah! We'll give him a hearty welcome then, Hurrah, hurrah!